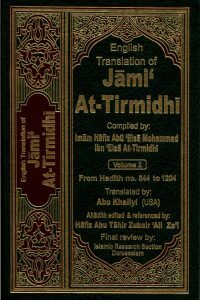 Jami` At-Tirmidhi is one of the classical books of hadith that was compiled by the great Muhadith, Muhammad ibn Isa ibn Surah At-Tirmidhi (209-279 AH). He was a special student of the great scholar of hadith, Imam Bukhari. He, like other great muhaditheen of our salaf, traveled a lot and quoted from many shuyukh. With 3956 ahadith, Jami` At-Tirmidi is an invaluable addition to any person’s library of hadith collection.